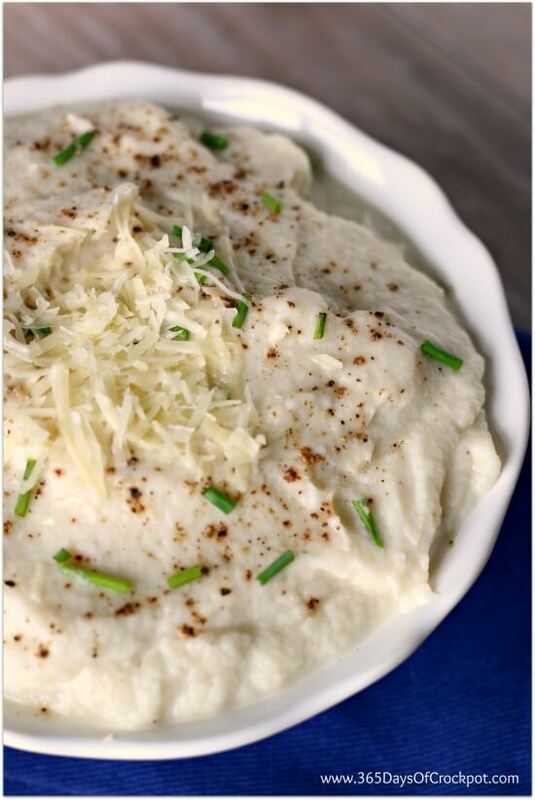 Although this looks like mashed potatoes it’s actually not. It’s mashed cauliflower. 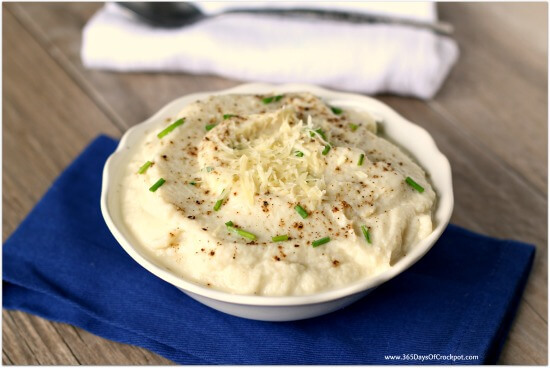 Mashed cauliflower is a great way to feel like you’re eating mashed potatoes with a fraction of the calories. 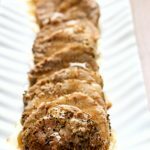 This side dish is seasoned with garlic, olive oil and Parmesan cheese to make it perfectly tasty for kids and adults alike. 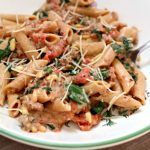 If you want to eat a creamy, comforting side dish without all the calories, this is a good choice. 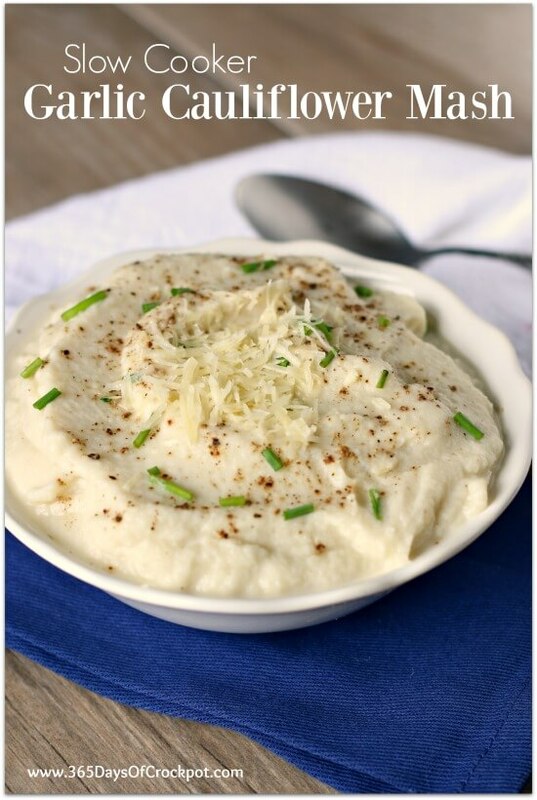 Although it doesn’t taste like mashed potatoes it can be served in the place of mashed potatoes. 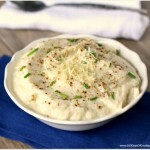 My kids and I both really liked this mashed cauliflower. 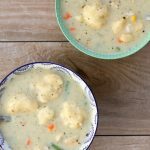 Place cauliflower florets into the slow cooker. 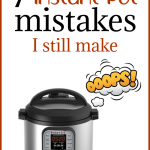 Fill slow cooker with water until it covers cauliflower. Add a bay leaf to the water. Dump in the garlic cloves and 1/2 tsp of salt. Remove lid and drain off all water (I placed mine in a colander). Discard the bay leaf. Place cauliflower back into slow cooker and add in the olive oil and Parmesan and 1/2 tsp of kosher salt. Mash using a potato masher until desired consistency is reached. Or alternately, you can pour cauliflower into food processor or blender and puree (that’s what I ended up doing). Salt and pepper to taste and garnish with chives. Serve! 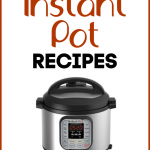 Do you have an instant pot recipe for this? No but I really need to make one! 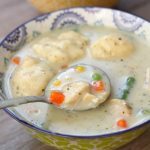 Is it possible to use coconut milk instead of water in the crockpot?